Is Foam Insulation for Your Raleigh, NC, Home Worth the Expense? 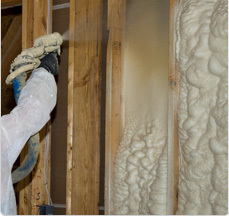 The installation of spray foam insulation in Raleigh, NC, can represent a significant investment, but because of the numerous benefits associated with foam, it may be an investment well worth considering. That’s because while foam is the most expensive insulating material to purchase and install, it also offers exceptional benefits that cannot be matched by traditional types of insulation. One very appealing benefit is money savings. Foam insulation is sprayed into the floor and wall cavities of your home as a liquid, sealing tiny nooks and crannies that allow precious heated or cooled air to escape. Sealing the openings means that your HVAC unit won’t have to work as hard to keep your home comfortable which could increase the life of your heating and AC unit and lower your energy bills as well. Additionally, while your HVAC unit may not have to work as hard as it did before you installed foam insulation, you will experience a more comfortable home environment with steady temperatures and cleaner air. Spray insulation forms a solid barrier that not only keeps your conditioned air in, it also keeps outside air out, reducing the amount of allergens like mold or pollen that can enter your home and make breathing more difficult for those who suffer from asthma or other respiratory ailments. Plus, you may enjoy a higher resell value if you ever put your home on the market. That’s because many potential buyers appreciate the benefits associated with foam insulation, as well as the knowledge that it will continue to perform for the life of the home. To learn more about the value of installing foam insulation in your Raleigh, North Carolina, home, turn to the experts with the experience and expertise to guide you through your insulation purchase, 31-W Insulation.